Began with a mission to create a small, advanced personal Drone that anyone could fly, a team of Micro Drone has reached to its fourth generation. They designed and developed a small, smart, and autonomous quadcopter drone mainly for aerial photography. It devised with a top-notch technology empowering you to capture stable aerial video on a tiny HD camera Drone. Micro Drone 4.0’s team has been making crucial changes in its design and have enhanced this gadget over the time. Their consistent efforts have resulted in this palm-sized autonomous drone which is truly innovative that pushes the boundaries of possibility. It has actually overcome the belief that only very large, heavy, and expensive quadcopters are able to provide stable and buttery-smooth video footage. A team studied feedback received in previous versions and pull all their efforts to design an ideal Micro Drone for all kind of users. They concluded with the three prime requests and developed this drone on that same basis. The most entertained request was to eliminate the steep manual piloting. To make an autonomous flight, integrated automatic self-hovering upon release of controls which the fundamental requirement to enable advanced autonomous flight capabilities, they said. The second request was common but the most essential one that is to get the smooth HD 1080P video. 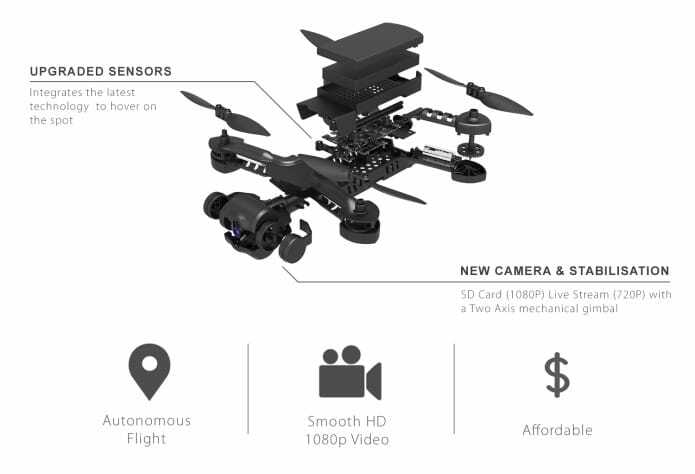 Accordingly, the Micro Drone 4.0 features a two-axis mechanical gimbal to get rid of that shaky footage. All these amazing features were expected to be available in an expensive and heavy drone. But creators have considered the third request and made available the “professional” experience within your means. Micro Drone 4.0 is available in an affordable package. Above were just fundamental features they have added respecting the customer’s feedback. In addition, they have a lot more features devised in this small gadget. Micro Drone 4.0 self-hovers, holds altitude and prevents drift for worry-free piloting. Regardless of this experience, it allows users to fly effortlessly. Combining the functions of both sensors that measure barometric air pressure and visual positioning from a downward facing camera, a drone has acquired a stable, precise hovering in the air. Unlike other drones available Micro Drone 4.0 launches quickly. 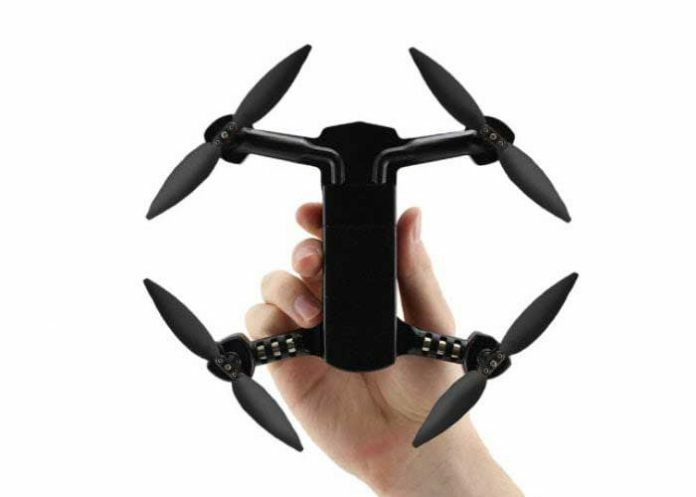 You just need to hold the Drone up, click the power button three times and Drone launches from your hand and in the air in seconds. It equipped the self hovering flight controller which enable this quick launch. Well to offer computer vision smart shots, Micro Drone 4.0 partnered with NEURALA®. Their cutting edge tracking software locks onto the target to perform automated flight maneuvers. This will further add three amazing features as 360° Orbit, in which circle selected point of interest and auto-rotate alignment focus on the center focal point. Similarly, cable cam reverses drone orientation to fly aircraft backward from launch location. Lastly, it visually searches for a human hand to initiate landing in hand with extended palm. Each element of this gadget is designed intelligently and keeping the actual necessity in mind. 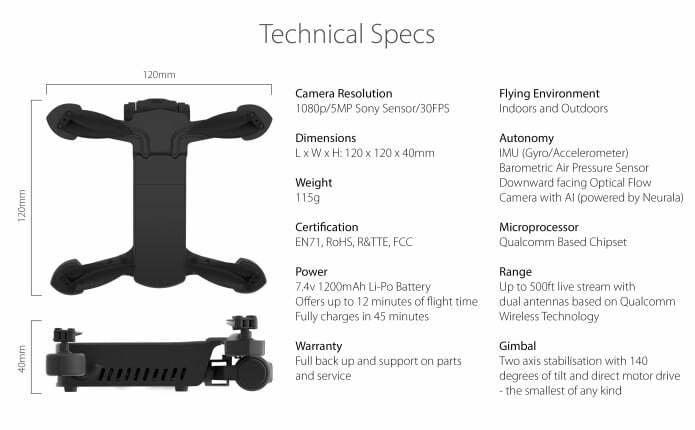 So to get the clear, high-quality videos and photos across desktop/mobile devices, it devised a full HD aerial camera. The onboard video processor operates up to 1.2GHz (a very good microcontroller) for better shooting performanceSupports H.264 at 1080p @30FPS or 720p @60FPS. Micro Drone 4.0 is capable of capturing more light for a clearer image, even in tricky light conditions, 1/2.3″ CMOS Sensor with F2.6 aperture. One more cool feature of this drone is its integrated an onboard SD memory card reader. Here you can save the video in high quality. Also, footage can be transferred between the Drone and Phone using the Drone’s Wi-Fi connection easily. You can seamlessly pilot Micro Drone 4.0 using its virtual joysticks on the App or combine with the external remote to fly further. Using the Long Range Remote Controller, you can fly Micro Drone 4.0 up to 700ft. It comes with a dedicated mobile application which is compatible with both iPhone and Android. This app allows users of any expertise to fly Drone seamlessly. Let’s not miss an integral part of Micro Drone 4.0, its battery. It upgrades the battery to a two cell 7.4v high-performance Li-Po battery enabling flight time of up to 13 minutes. The battery has a capacity of 1200mAh and weight of just 26 grams, batteries can be charged using the Micro USB port built into the Drone. Also, you can carry multiple batteries on the go. It’s foldable and so the compact design makes it easily transportable anywhere. Additionally, it has several advanced safety features for your ease of use and peace of mind. Such as it is lightweight and quiet, immediately reestablishes App and Drone communications if the connection is lost, it alerts you when the battery level is low. Likewise, its intelligent collision avoidance system land it safely even when the connection is lost. Besides, it has a safety feature of damage prevention with the immediate motor shut down if Drone flips or crashes and you can set the range limit. Micro Drone team is effortlessly working to make user experience better with time. Hence they have provision to add additional features and accessories.